Restylane in Glendale, Pasadena, Encino and Burbank. Patient 1: This patient underwent upper lip augmentation using a soft silicone lip implant. Small (3mm) incision was placed in the corners of the mouth. The small scar cannot be seen. The lip feels smooth to touch. Silicone lip implants offer a permanent solution for lip augmentation. Patient 2: This patient also underwent upper lip augmentation using a soft silicone lip implant. Permanent augmentation. Patient 3. Upper lip augmentation using a soft silicone lip implant. Patient 4. Upper and lower lip augmentation using silicone implants. Patient 5. Upper and lower lip augmentation using silicone implants. Patient 7. Upper and lower lip augmentation with Restylane injection. Temporary augmentation lasting typically months. Patient 8. Upper lip augmentation with Restylane. PATIENT 1. This patient underwent injection of Restylane to reduce the depth of her smile lines (nasolabial folds). PATIENT 2. This patient underwent injection of Restylane in the smile lines (nasolabial fold) to decrease their appearance. At the same time upper and lower lip augmentation was also performed with Restylane. This patient had liquid silicone injected in her lips by another practitioner. 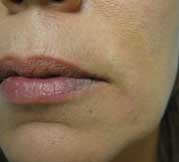 She developed bumps (granulomas) with irregular contour of the upper lip. 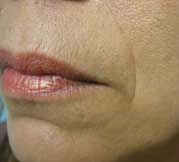 Excsion of the granulomas was performed to achieve a smoother contour of the lip.